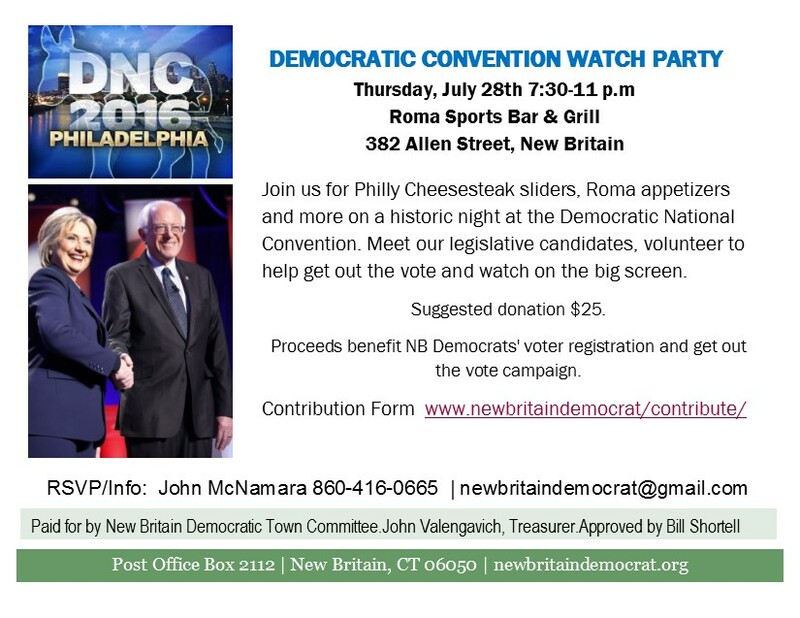 The Democratic Town Committee (DTC) will host a Democratic National Convention Watch Party on July 28th from 7:30 to 11 p,m. at the Roma Sports Bar & Grill dining room, 382 Allen Street. The suggested donation for the watch party is $25 (www.newbritaindemocrat.org/contribute/). Proceeds benefit NB Democrats’ voter registration and get out the vote campaign. The DTC event will be an opportunity to meet our candidates, volunteer to help get out the vote, enjoy Roma appetizers and beverages as Democrats’ are expected to make history 96 years after the 19th amendment to the Constitution gave women the right to vote. Former Secretary of the State Hillary Clinton is expected to accept the nomination on the last night of the convention.